The 2018 World Water Week, which was held in Stockholm from August 26 to 31, organized by the Stockholm International Water Institute (SIWI), is an annual international conference focused on global water issues. 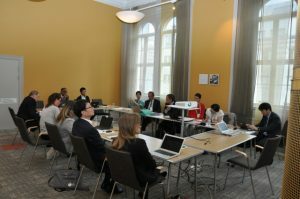 Experts, decision-makers, businesses, young professionals, and NGOs from across the world gathered to discuss water issues. In 2018, over 3,600 participants from 133 countries attended nearly 300 sessions on the theme Water, Eco-systems and Human Development. Taking advantage of this opportunity, the JWF, secretariat of the Northern Water Network (NoWNET), convened its annual Members’ Meeting. NoWNET was launched in 2004 as a networking organization with the aim of sharing knowledge and experiences, and strengthening partnerships among developed countries. Today, it is composed of country-level water partnerships from nine countries including France, the Netherlands, Switzerland, Denmark, Sweden, Finland, Portugal, South Korea, and Japan, along with two leading water-related organizations: the World Water Council and Global Water Partnership. 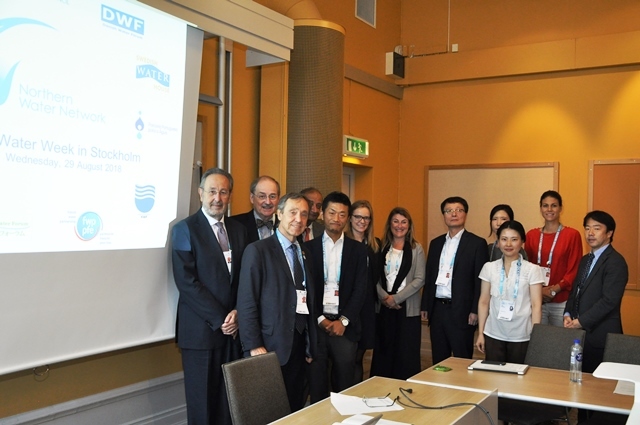 At the 2018 World Water Week, representatives from nine organizations belonging to NoWNET gathered to share the current and future priorities of each organization and to discuss collaborative activities and opportunities. Last year, NoWNET organized a side-event at COP23 of UNFCCC. It was designed to raise awareness of people involved in the UNFCCC climate change discussions, about the importance of solving water issues and the necessity for action, as water issues are a crucial part of climate change issues. The JWF, as secretariat of NoWNET, considered it desirable to continue this kind of initiative and proposed an outline for cooperation within NoWNET at this annual Members’ Meeting. Based on the results of discussions, the JWF, together with other member organizations, will share knowledge and experiences about adaptation measures for climate change from the perspective of water issues, focusing on the private sector initiatives. The JWF will also advance preparations towards COP24, to be held this December. NoWNET facilitates mutual visits between companies in member countries as well as exchanges and collaboration. If you are interested, please do not hesitate to contact nownet[at]waterforum.jp.